Beneath the sometimes pandering and relentless references to the Internet of today and the lingering feeling that this film will be almost embarrassingly dated within six months of its release, “Ralph Breaks the Internet” offers a heartfelt lesson on friendship for its younger viewers. The core thesis of the film, which reassures children that distance and disagreements do not harm truly strong friendships, will undoubtedly be buried in the wealth of groaning reviews decrying what an obvious cash grab the film was. Yes, the film was a cash grab. That was obvious from the references to Buzzfeed, YouTube, Fortnite and the titular reference to a particular Kim Kardashian West photoshoot from 2014. The product placement was blatant enough to question how organically this Internet-based sequel to a film about arcade game characters came about. Was it truly to develop the storylines of Vanellope and Ralph, or did dollar signs dance sweetly in the heads of Disney executives when they realized how big a payday they could have off of the Internet? These criticisms are valid. Much of the opening minutes of the film feel predictable; boring old Ralph wants to stay in the arcade where he knows what to expect while adventurous Vanellope craves excitement. 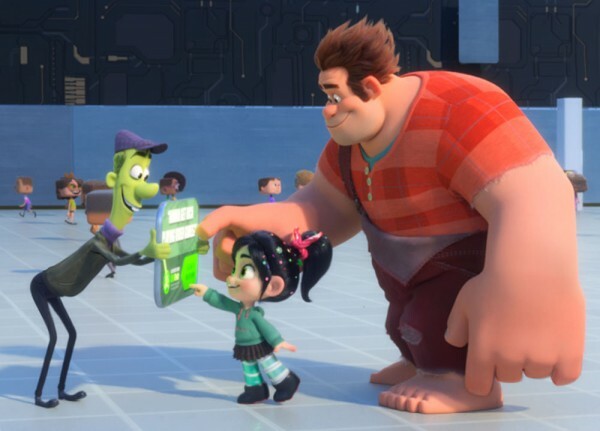 Their circumstances for exploring the World Wide Web are believable enough; Ralph breaks the steering wheel to Vanellope’s game so they set off on a mission to the universe’s equivalent of the Emerald City of Oz: The Internet. Then they have a rollicking good time causing havoc and pointing at silly little Internet references that the audience can guffaw at. Look, Ralph is doing The Floss! Look, Ralph has to make viral videos to make $27,001 to pay for a replacement steering wheel for Vanellope’s game! Look, that sort of famous YouTuber is in the movie for two seconds and probably got paid a lot of money to spit out one line! It is cheap, pandering and annoying at best. At the end of the film, though, that is not what matters. As the story unfolds, the audience is treated to a carefully crafted fable about friendship. Ralph is forced to confront the fact that it is okay that he and Vanellope want two different things. Ralph learns that he cannot hold her back from pursuing a dream just because he wants her by his side. Two people in a friendship are individuals. It is a surprisingly nuanced subplot to sneak into such a shallow-seeming film. Yet that makes it all the more important for a significant portion of the intended audience: children. They are not old enough to understand things like this; they may assume that friendship is all-consuming, and that if they do not agree they can no longer be friends. It is crucial for movies to include subplots like these so that children understand the value that the relationships they have with other people can hold. When Vanellope and Ralph tearfully come to an understanding about their respective futures, each of them having one half of the “You’re my hero!” necklace that Vanellope gave Ralph in the previous film, those emotions are real. It is a genuinely beautiful moment and serves as great emotional payoff for the respective struggles that Ralph and Vanellope have throughout the film. Ralph grapples with the sometimes-crippling insecurity that drives his devotion to Vanellope and realizes that in some situations, friends need to let each other go so they can both be happy. Even though they go on to live separate lives, they are still shown to communicate weekly and their friendship seems stronger for their separation. Showing the benefit of situations like that can be so helpful for kids going through the stress of similar situations, like a friend moving away. The Internet stuff, which is beautifully constructed as a sprawling metropolis in the film, is just background to Ralph and Vanellope’s development as characters. They are fitting parallels to the children that may be watching the film. When reviewing children’s movies, it is important to view these films through the lens of a child. They might not notice the flaws in the endless pandering to them via Internet references that will become tired before the year ends. They will just find it funny. And that is fine. The movie will not appeal to many teenagers or adults who are cognizant enough to look beyond the references and see product placement. That is all okay. “Ralph Breaks the Internet” does just fine as a halfway decent movie made for kids. The atmosphere in which it is set will age out of relevance almost immediately, which will doubtlessly diminish its charm, but the central theme of friendship at the heart of the movie will never grow old.